DANVILLE, PA -- Danville resident, June Bryan Belfie, just had her first novel published by Desert Breeze Publishing House. 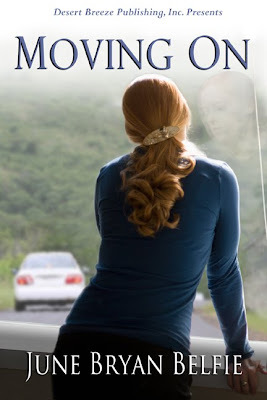 Her novel, Moving On, focuses on the trials of a Christian woman trying to move forward after a painful divorce. Ms. Belfie has contracted three additional novels, for publication within a year. "Having experienced divorce myself, I felt qualified to write this novel," says Ms. Belfie. "My divorce occurred over four decades ago, and although my wonderful second husband of over thirty years has helped me grow and forget, many painful memories still linger. I try to use these memories to make my characters more real to my readers." Laura is a dedicated mother of a teen-age girl, Kim, who tries her patience at times, but is a true blessing. She plays a dominant roll in the story as do Laura's parents and friends. Although Laura's husband, Dave, a doctor at the local medical facility, was guilty of infidelity, Laura questions her own role in the separation. A line from the book has Laurie asking herself, "What have I done? Where have I failed? God, where are you in this?" Then Laura meets Len, a widower who cannot give up his devotion to his deceased wife. They develop a close friendship. Due to an illness, however, her ex-husband, Dave spends more time with Laura causing her to wonder where her feelings lie. Can Len ever learn to love again? Will Dave return to repair the marriage? Readers can purchase this e-book through Desert Breeze, Amazon, Barnes & Nobles, or other e-book distributors. It can be downloaded onto an e-reader, such as Kindle, as well as a home computer or I-pod. June Belfie is a snow bird who spends her winters in Florida.